You’ve been seeing this same dough recipe pop up over and over as I post new recipes. It has definitely become my go-to dough recipe for quick, kid-friendly meals that are also healthy. I decided today to highlight and feature my friend, The Versatile Dough. He (she?) is a winner in my book and can multitask in my kitchen to create all kinds of wonderful food. So back to my point, because surprisingly, I really do have one. I love this Whole Wheat Dough. I use it a lot. I think you will love it too. 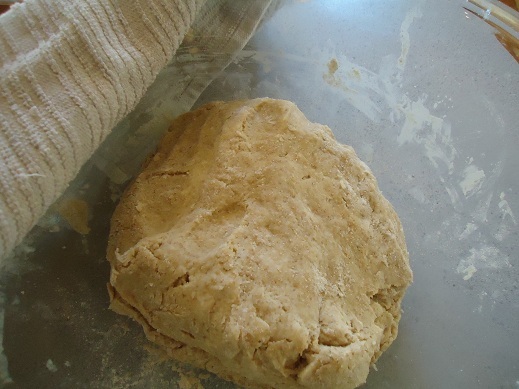 Mix all ingredients and knead together until a nice dough has formed. (If you’re using store-bought flour, you will probably not need all 3 1/2 cups of flour.) You can roll out and use this dough right away, or you can allow it to sit on the counter-top overnight (covered) in order to break down the phytates in the wheat and make it more digestible. I bet if I think real hard, I can come up with several more ways to use this dough. Have you tried making this dough before or any of the above recipe ideas? You MUST try it – it’s buttery, flaky, healthy, tasty and EASY! Just the inspiration I need to get through the next couple weeks of meals. Thanks! Yum! 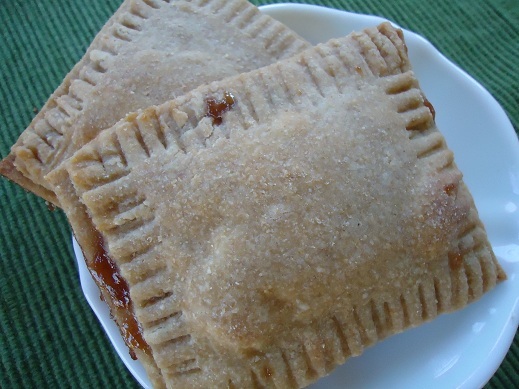 I’ve used this dough recipe for the apple pie pockets, poptarts, and pigs in a blanket. All three were delicious! You are too funny Laura! But yes, actually I would love to be a fly on your wall sometime. Or maybe just a guest in your kitchen ;). Don’t think I’ll be making it out that way anytime soon. But hey, if you ever come to SoCal, I’ll let you cook in my kitchen! Actually, I do have a question about this dough b/c yes, I have tried it and it’s not too bad. Anyways, if there something non-dairy that I could use besides the yogurt to make this dough? I’ve not tried it myself, but I would imagine you could use coconut oil and rice milk?? I was wondering that too. Our daughter has dairy allergies. Coconut oil would probably work well, but the yogurt would be much thicker than rice milk. I was wondering about coconut milk with a little vinegar to give you that sour-ish taste. Maybe just less of it since it would be thinner than yogurt? Let me know if you try it. I was just going to comment about this as well!! I just FINALLY tried making Laura’s quiche using whole fat coconut milk in place of heavy cream…and it WORKED! It tasted just like quiche with absolutely no coconut flavor!! My family ate it right up!! So what I plan to do for this recipe is use whole fat coconut milk with 1 tablespoon of fresh lemon juice! I think it’s just a thick as yogurt and the flavor is SO mild, that I doubt you’ll taste it! I am excited to try it! Thanks Bobbi! I’ll give that I try. We don’t have dairy allergies but I believe that my 3 year old has a dairy sensitivity :( It’s really hard to take dairy out but we’re working on it. It hard b/c I don’t know if that’s really the issue or what it is. Is full fat coconut milk sold next to regular coconut milk? You won’t find this milk in the “milk” section at the store. The coconut milk I purchase is usually in the “ethnic food” section at a grocery store and it comes in a can. The brand I usually buy is “Thai Kitchen” coconut milk. You will usually see cans that just say “coconut milk” and cans that say “light coconut milk”…you want the regular stuff! Shake the can really really before opening it! Good luck! sour cream in similar recipes. I *love* this dough as well. I originally got it off of http://www.thenourishinggourmet.com It is her cracker dough. I have tweaked it to make it sourdough and it is SO good! I use it to make crackers and I use 1/2 this in any recipe calling for a can of crescent roll dough. Yes! I used the dough to make crackers the other day too – I forgot to mention it! I’d love to hear the sourdough version. I’m always looking for great sourdough recipes. Can you post it? canned crescent rolls and it goes over very well each time! Thanks! I may have to try that sometime! I just made the “pigs in a blanket” for dinner tonight. Hubby wasn’t thrilled with the dough but I liked it. Though saying “hubby wasn’t thrilled” should be followed by “he still ate half the batch”, lol. It reminds me of an old family recipe, only ours calls for cream cheese not yogurt and we fold it over to make jelly cookies. I use fine ground Redmonds Real Sea Salt. I’m adding this to our meal plan this week. We’ll be trying it as a pizza dough. I made the poptarts not too long ago and I didn’t like the tartness of the dough. It was definately the yogurt, so I was wondering what would be a good replacement for that? You can try replacing the yogurt with milk. You’ll probably not need the entire cup of milk, but I know others have tried it this way and the dough has still worked well. I made the poptarts for the first time this weekend, and they were such a hit! Just wondering—-could this be used as pie dough? I can’t make good pie crust for anything and was thinking this might work. Have you tried it? Love all your posts, and everyone’s comments,too! Yes, I think this would definitely work as a pie crust! Thanks for sharing. I am always trying new dough recipes. I will give this one a try, but I can’d decide if I want pizza, pop tarts, pigs in a blanket . . . Choices, choices, choices! When I tried this dough for your pizza pockets a while back, it was extremely difficult to roll out. Do you ever have trouble with this? I’d say next time try adding less flour to the dough as you stir it together. If it has too much flour, it will be very tough and difficult to work with. I have made this dough several times. I have made the pizza pockets, the homemade poptarts & pigs in blankets. I’m interested in making this gluten free, do you have a particular GF flour that you know would work well? Off hand I don’t know of which flour would work best. As I experiment with different grains, maybe I’ll eventually come up with an idea for this! Her whole website is really fantastic! Highly recommend it. Hope that helps! I’m sure that would work fine! I have made this dough and it is incredibly good! It tastes like the crust of a pot pie, to me, but it’s a healthier version. It’s rich and yummy and delicious and I’m so glad to have this recipe. Thanks, Laura! I’ve used this dough for a chicken pot pie and it was perfect…when using the freshly ground white wheat you can’t tell it’s whole wheat. I know what we will be making for supper! Thanks! I assume I knead this with my kitchen aide. I don’t have a kitchen aide, so I just knead it by hand, but yes, I’m sure this would work with a mixer! We have made the pizza pockets and they are wonderful! The pop tarts didn’t go over so well in my household. The kids wanted more jelly in the middle and I ended up eating MOST of them…not good! 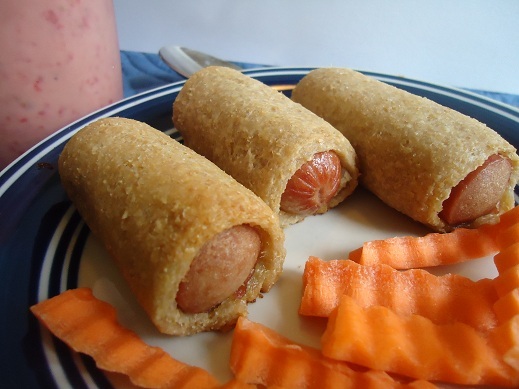 I am planning on trying the pigs in a blanket next week when I am watching 4 extra kiddos. This seems like a good recipe to use for pies during the holidays. Or do you have another recipe you use for that? Thank you, again, for all your wonderful healthy recipes. I very much love this dough and I could eat it all the time. I’ve been making it with red wheat flour but the hubs is not a fan so I got some hard white wheat flour to use next time. For the two of us I always half the recipe and it comes out perfect for one large pizza or 4 HUGE pizza pockets that heated up surprisingly well in the microwave! I love this dough for the pizza pockets and find it rolls better if I let it sit for 15 minutes. I also love it for the apple pie pockets but use vanilla yogurt. Will try the cracker idea next! Hello, I’m a french regular reader (I not leave some comment since yet). I will just say you that your dough his the best recipe I never made!!! I will made some for the supper tonight with some salted pumpkin filling in to form some pocket. My children (and my husband!!!) absolutely love your poptarts!!!!! Interestingly enough, I’ve wanted to make this dough for the last two months and finally made it last night for pizza before this e-mail came in! It worked up so nicely and EVERYONE loved it. This is a quicker version than making a yeast pizza dough. Thank you! I love new dough recipes. I have a question, all of mine use yeast, do I not need yeast in this one? Sorry if that’s a silly question. Ha I just made whole wheat bread–the best–this dough for pop tarts, and whole wheat sourdough biscuits today for a comping trip. I’ve made all before with mixed results. I do find that the pop tart recipe is difficult to roll out too and I nver get as many as you do-not even half. This is the first time I’m using hard whiite wheat, ground myself. Hoping this makes a difference. But Laura help!!! When you are soaking–whether dough with yougurt or dough with buttermilk–is it more flour so a dry dough or more liguid so a wet dough? Your bisquit recipe says to add more if needed, but I’m not sure if it needs it or not. Thank you for all you do I learn so much. And I’d love to be a fly in your kitchen. I’d see how you balance school and cook and then get to “taste” all that yummy food. I guess it depends on the flour you use – the reason I say to add more flour if it’s too wet is so that people aren’t dealing with a sticky mess when trying to roll out dough. But if there’s too much flour, it will be difficult to roll out. Whether soaking or not, you just want to stir together the dough with flour until it is a good consistency for rolling out nicely. Since switching to this recipe for our pizza nights, DH now enjoys pizza. Made a quiche the other day and wanted to try it for the crust, put just did the old one. From the comments above it appears that this would work well for pie crust. Yeah! Can’t wait to do so. Thank you, Laura, for the recipes, the encouragement, and the great sense of humor to help my day along. Blessings to you and your family. Have a wonderful day. We have used this dough for several of your recipes and as a replacement to some old pamperchef recipes that I make without the store bought dough. I have a soaking grains question, which I know only somewhat pertains to this post. I’ve been soaking my flour for bread for a few months now, always in cultured buttermilk. My bread has never had a bitter or sour flavor. That is until the last two times I’ve made bread. I don’t mind the sour taste as much, but my family won’t eat it. I tried using a different brand and fresher buttermilk the second time and it was still bitter. Thoughts? Suggestions? Hmm, that’s interesting – I was going to suggest making fresh buttermilk to see if that would help but it sounds like you already did that. If your kitchen is warm, the culturing process in the bread will go more quickly and sour it faster. Maybe that’s what’s happening? I bet that’s it – more warm and humid maybe? during the day and see if it helps. And I hadn’t thought of making my own buttermilk. That’s a great idea! Thanks for your help! I love your blog, by the way! So many great ideas! I’m getting ready to make a GIANT batch of this dough and make most of the things you have pictured above! Thanks Laura. I have found this website to be an invaluable resource as I’ve been toiling for years trying to find a way to eat healthfully ALL the time only to start and conclude we can’t afford it so we stop. Then we start and conclude we don’t have the time to constantly be in the kitchen (where I am for most of the day ANYWAY)so we stop. Seeing that you can do it and having you spell out HOW you do it has been an enormous help and comfort:) THANK YOU! Do you ever freeze this dough before baking? No, but I believe it would work! Thanks. I made a double batch but don’t have time to bake both. I’ll try it for pizza next week! I froze it and it worked great after being thawed :). Roll it up into a long “log” and slice for cinnamon rolls! No rising, of course, but they turned out wonderful for us. Still soft and gooey! We put the slices in a pan and pop them into a preheated 350 degree oven for 30 minutes. Good with or without frosting. It makes for a quick mid-morning snack for us when the dough rises overnight. It does get sour the longer it sits so I only let it soak about 6-7 hours and it is really good! Just doubled this for pizza tonight & chicken pot pie crust to make after kids’ bedtime tonight for the freezer! Double whammy! Laura, if I really knew you & you really knew me, I’d be bringing you an apple pie right about now out of thanks for you and all you share here!! I liked this (although a bit dry) but my family did NOT!!! I was looking forward to trying the flaky cream cheese pastry, but can’t imagine how it would be flaky or anything like the “chillsbury” dough that we used to eat before choosing REAL food. Also – my hubby is aching for a real puff pastry like he loved from the cans. I am so so thankful to you for posting this recipe!!! Can you please suggest for how many days can the dough be refrigerated? I’d probably only leave it in the fridge 1-3 days before using it.